Like most recent graduates, Dawn West is trying to find her way in the real world. Her roommate in a New York City apartment views paying rent as optional. Her ex-boyfriend isn't really staying an ex; they can't stop seeing each other. Her writing career is the extent of writing a lawn care advice column, until she lands a freelance job tracking down the past winners of Charm magazine's "Ten Girls to Watch" contest and interviewing hundreds of fascinating role models. Dawn gets to interview amazing women who were once outstanding college students, now mayors, opera singers, writers and other impressive careers. Their stories are inspiring to both the reader and to leading character, Dawn. She takes their experiences to heart and analyzes her own life, creating her own success story. 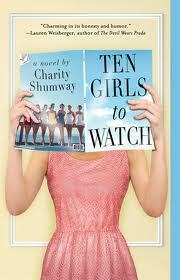 Ten Girls to Watch is Charity Shumway's debut novel. I like her writing style and the book's format. Each chapter begins with a photo and profile of a past winner. Dawn is a well-developed character. Readers see her growth and personal progress throughout the novel. There are also tidbits of life advice sprinkled through the narrative. Nicely done. This is one author to watch.